Pretend for a moment that you own a building. Let’s make it a luxurious high-rise in the bustling downtown of a large city. Occupancy is high, rents are up, life is pretty good – until someone calls and tells you the building across the street is scheduled for demolition with high explosives. Still feeling calm? Don’t worry – Terracon vibration monitoring is here to help. Vibration monitoring is the science of detecting and recording ground vibrations caused by construction or demolition activities. Hiring a firm with a working knowledge of dynamics and vibration is crucial to understanding monitoring results. The equipment utilized typically consists of two parts: a sensor unit and a recording device. The sensor unit utilizes three accelerometers oriented on three orthogonal axes (i.e., up/down, left/right, forward/back). The recording equipment contains signal processing and data storage devices. When a ground vibration above a threshold level is detected by the sensor unit, the recording device switches on and records the signals from each accelerometer. The resulting data is processed and presented to the user with the relevant metrics displayed prominently for comparison with published guidelines. Depending on the activity, vibration monitoring can be conducted during a single event or on a long-term continuous basis using remote monitoring equipment tied into a cellular data network. Terracon has provided vibration monitoring services on a variety of construction and demolition projects, working for building owners, demolition contractors, and other stakeholders. 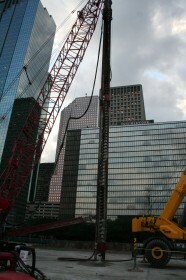 In one particular situation, Terracon was contracted to conduct vibration monitoring at a 36-story office building in downtown Houston, Texas, during the implosion demolition of a city-block-sized 10-story retail building that was just across the street. Without the data Terracon recorded during the demolition, building owners would have had no way of proving that ground vibrations at several locations exceeded safety guidelines, potentially causing damage to a portion of the subject building’s curtainwall. 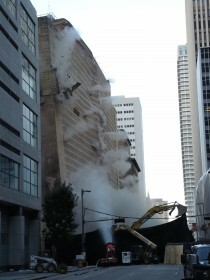 Spectacular as a building implosion may look, most demolition projects move at a slower pace. Mechanical demolition involves the use of heavy construction equipment to methodically tear structures a part piece-by-piece. In 2013, Terracon provided on-call vibration monitoring services for a concrete parking garage structure at the University of Houston’s Downtown campus. Several buildings were situated in close proximity to the parking garage, in some cases with less than three feet of separation. Terracon installed and continuously monitored ground vibrations, delivering feedback in real-time to equipment operators about the impact of ground vibrations. While all participants strive for minimal collateral damage, few demolition projects go exactly as planned. Vibration monitoring provides hard data that supports building owners and demolition contractors alike. In some situations, even low-level ground vibrations can be risky. Historical structures can be very expensive to repair, and some have exceptionally low structural tolerances for ground vibrations. Medical and laboratory equipment like MRI suites and scanning-electron microscopes are extremely sensitive to vibrations, making hospital and research facilities good candidates for vibration monitoring. 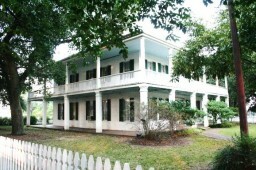 Between 2007 and 2008, Terracon conducted long-term vibration monitoring at the Kellum-Noble House, constructed in 1847 and the oldest masonry structure in Harris County, Texas. The historic structure was also located near an 11-story concrete parking garage under construction. Terracon deployed four vibration monitoring units equipped with external power supplies and remote cellular networking equipment that provided continuous vibration monitoring and off-site data acquisition and review for approximately six months. Terracon’s remote vibration monitoring capability gave our client a cost-effective means to measure ground vibrations near a fragile historical structure during long periods of construction. BEFORE AND AFTER: SEE A DIFFERENCE? Just as important as vibration monitoring, pre-activity and post-activity assessments are crucial to establishing the extent of damage caused by ground vibrations. 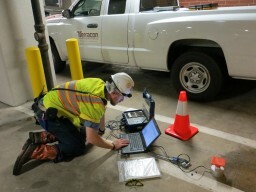 Before a vibration-inducing action begins, Terracon personnel inspect vulnerable structures for existing conditions. Photographs, videos, and handwritten notes are used to build a record. After the vibration-inducing activity is complete, the vulnerable structure is inspected again and a similar record is made. Attention to detail is critical, and the smallest crack can lead to expensive litigation proceedings. When a stakeholder alleges vibration damage at the structure, the two records are compared to support or disprove their claim. Whether the pre- and post-activity assessments are conducted by Terracon or by a third party, having solid documentation of existing conditions is in everyone’s best interest. For clients in the facilities, construction, or demolition industries, Terracon’s vibration monitoring services provides hard data that safeguards their interests. 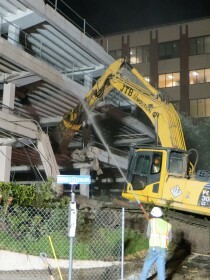 The following video shows the demolition of a historic building in downtown Houston, Texas.